After Adam and Eve were driven out of Eden, they began to cultivate the soil, which, though choked with briers and weeds, by hard labor was still made to produce abundantly for their uses. God soon after gave to them two sons, the elder of whom was called Cain and the younger Abel. 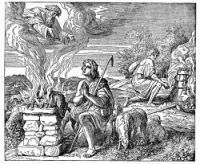 As they grew up Cain became a tiller of the soil and Abel looked after the flocks, so that Cain and Abel became a great help to their parents. On one occasion, while working in the the field together and alone, Cain and Abel made sacrifices to God, as there parents had taught them. Abel sacrificed a lamb, and Cain offered a sacrifice of the grain and grasses of the field. 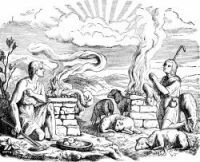 Each would have been acceptable to God had they been made in the same loving spirit, but Cain made his offering with a rebellious and sinful heart, while Abel rendered up grateful thanks for the mercies he had received. Thus God was pleased with Abel's offereing and offended with Cain's. 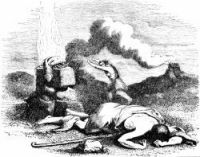 Cain became so incensed with Abel that he killed him. God had witnessed the murder, but he did not kill Cain; instead, he sent him out as a vagabond and outcast upon the world, with a brand upon him that would serve to show to all who should meet him that he was his brother's murderer. These moving images of Cain and Abel are from my collection of old Bible books. 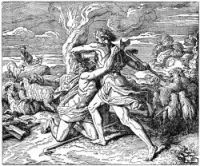 Feel free to use these illustrations of Cain and Abel in your artwork. 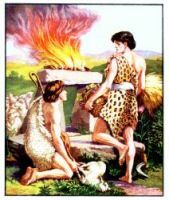 Click on the Cain and Abel pictures below to see more details about saving a free Cain and Abel image or about purchasing the Cain and Abel drawings at a higher resolution.